I’m a very lucky man. 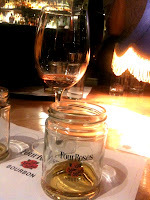 Not only do I have the pleasure of tasting three different bourbons from the Four Roses distillery today, but I get to do it in the company of Jim Rutledge, or “Mr Four Roses”, the master distiller there since 1995. That’s a full three years longer than I’ve even been drinking! Granted, I’m merely one of around 40 other bourbon fans, but in fact that made the experience all the better. Tasting is such a subjective experience by its nature, that having as many other palettes involved as possible always improves the event. Initially based in Atlanta, Georgia, the Four Roses distillery was set up in the 1860s, and moved to Louisville, Kentucky in 1884. The business was owned by Mr Paul Jones Jr. 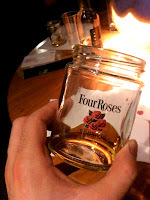 The name Four Roses was inspired by a marriage proposal made by Jones Jr to the lady he was courting: she subsequently wore a four rose corsage to a ball they were both attending, thereby indicating her acceptance. Prohibition (1919 – 1933) was of course a difficult time for the distillery, but they weathered the storm by producing small amounts of whiskey for medicinal purposes, with G.Ps actually writing out prescriptions of a pint every 10 days for those deemed ‘unwell’ enough (one imagines that ‘thirst’ was a common and chronic complaint). 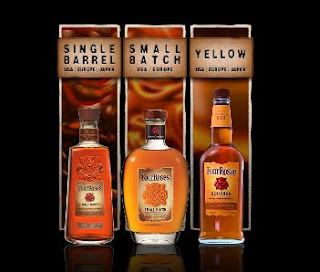 As I mentioned, we had three whiskeys to peruse this afternoon; the Yellow Label, Small Batch, and Single Barrel. I was surprised to discover that each of these if made to a completely different recipe, utilising two different mash bills and five different yeast strains, which therefore provide ten different recipes from which to blend their bourbon together. They have a ‘target recipe’ for the Yellow Label, which can then be tinkered to perfection and consistency depending on their interaction with the American white oak casks, the weather, temperature, and other influences which can affect the outcome of a quality bourbon. This approach, aside from fuelling geeks like me with information, enables Jim to be able to turn out fantastic tasting bourbon year after year. The Yellow Label was served in a branded Four Roses jam jar, for reasons visual rather than olfactory. This light straw coloured liquid has a sweet nose of honeycomb, cloves and honeysuckle. Apple and pear provide a fresh background to the gentle spiciness of the rye grain, which keeps this bourbon lively on the palette throughout a long, soft finish. I know the idea of this kind of exercise is to retain a degree of objectivity, but it must be said that enjoying this bourbon, with all its prohibition era history, from a jam jar really does add to the experience. There’s a “hick drink” unpretentiousness, a snubbing of the cognac snifter plea to be taken seriously, and it works. 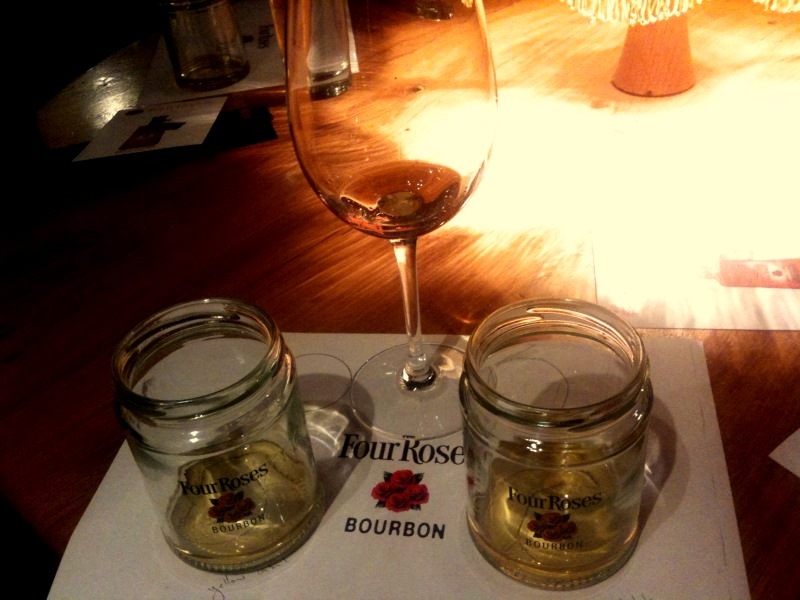 Our next subject, the Four Roses Small Batch, was presented in the same vessel. Defying gravity as it defies convention, the brick red liquid clings to the jam jar’s sides as though it were its given right to be there. This recipe brings the bourbon in at around 27.5% rye, which is apparent on the nose. I don’t know whether it’s due to Jim’s description of the measures they have taken in the warehouse to reduce the temperature differential between barrels from 36f to 6f, or the mustiness of the nose, but the sensation here is almost of being teleported to the Four Roses warehouse (which, incidentally, is located rather unusually 50 miles from the distillery). There’s also an energy here, almost effervescent, perhaps a result of the 45% abv. Maturity is obvious upon tasting, with dried orange and lemon peel and increased spiciness. Mr Rutledge tells us the small batch target age is 6.5 years, but more often than not it works out a little over 7. You’ll never see an age statement on the bottle though, since the blend is achieved by how it tastes, not what the calendar says. Following the Small Batch was the Single Barrel, a 100 proof spirit with a red/gold hue, baring more than a passing resemblance to a light rum. Served in a wine glass, the high alcohol content was immediately obvious, followed by a creamy, vanilla style as a result of the eight or more years this spirit spends in American white oak. Surprisingly though, it is the rye, not the alcohol, which tickles the tongue with its spicy character. For what it’s worth, my palette found the Small Batch to be the superior sipping spirit in the selection. Yellow Label perfectly drinkable, and certainly a good ‘mixing spirit’, and the Single Barrel a powerful, spicy, bourbon – ideal as a digestif after some traditional southern cooking.